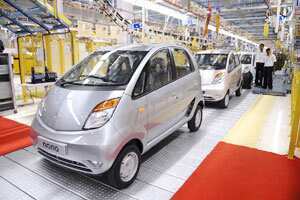 Mumbai: Tata Motors released an upgraded Nano model, the company said on Monday, as it looks to improve on well below-estimate sales of a product touted as the world’s cheapest car. Sales have underperformed expectations, as rising input costs forced the firm to increase the car’s price, and a land dispute at the model’s original factory forced Tata to move production to an alternative site. In November, Tata offered Nano owners the option to install safety protection in their vehicles after local media reported that seven cars had caught fire. The carmaker said it was not a recall as the fires were specific to the units. The new Nano boasts increased fuel efficiency, a more powerful engine and new interiors, the company -- India’s third-largest carmaker by domestic sales -- said in a statement.